You've all heard about the Brooklyn dollar vans, run primarily by Jamaican and Haitian immigrants connecting various Black neighborhoods to downtown. You may have heard about the vans connecting the subway and Long Island Railroad stations in Jamaica (the neighborhood in Queens, not the island) with other Black neighborhoods in Southeast Queens, also run by West Indians. If you're faithful readers of this blog, you've heard about the network of Chinatown vans, run by Chinese immigrants, connecting Chinatown, Flushing, Elmhurst and Sunset Park. You've also heard about the New Jersey vans, connecting the Port Authority bus terminals in Midtown and Washington Heights with various towns in Hudson, Bergen and Passaic counties, run by Dominicans, Peruvians and Egyptians, among others. I have a new addition to this list: Korean vans from Queens to Bergen County, New Jersey. As far as I know, this is the only direct transit service connecting the west side of the Hudson with the east side of the East River, except for a few sports specials. It's definitely the only transit service I know of that connects the two without stopping in Manhattan at all. Last month, I was walking in Flushing with Stephen Smith and saw a van with a web URL on the side. I looked it up and discovered that Koreana Tours, a travel agency, is running a regularly scheduled van service (scroll down for English) from Flushing to Fort Lee and Palisades Park. 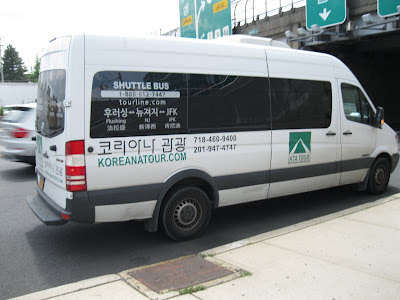 If you've ever been to those places, you know that along with Koreatown on 32nd Street in Manhattan, they're the biggest Korean communities in the area, so it makes perfect sense that a van would make that trip. Today I showed up at the Koreana Tours office at the corner of Union Street and 39th Avenue, just a couple blocks from the Main Street subway station. I had time to grab a pastry at the cafe across the street, and then the van pulled in to the Municipal Parking Lot. 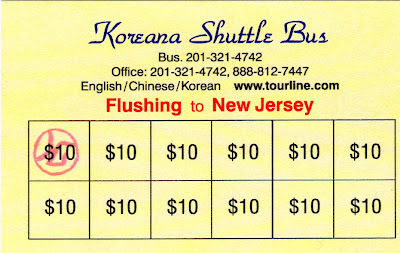 At first the driver and the manager didn't believe that a white guy wanted to take a Korean bus, but when I said I wanted to go to Fort Lee they were happy to take my ten dollars. They even gave me one of these stamp cards, so if I take the van ten times I get a free ride, just like buying coffee. As you can see, this is not a jitney, it's a scheduled service with six runs a day in each direction. It took me a little while to figure it out, but it seems clear to me that the departure times for Fort Lee and Palisades Park are reversed. So for example, after the van dropped me off in Fort Lee at 2:10, it continued on and picked up more passengers in Palisades Park at 2:20, then came back to Fort Lee at 2:30 and arrived back in Flushing at 3:10. The 9:20AM and 8:20PM runs continue on to Kennedy Airport. 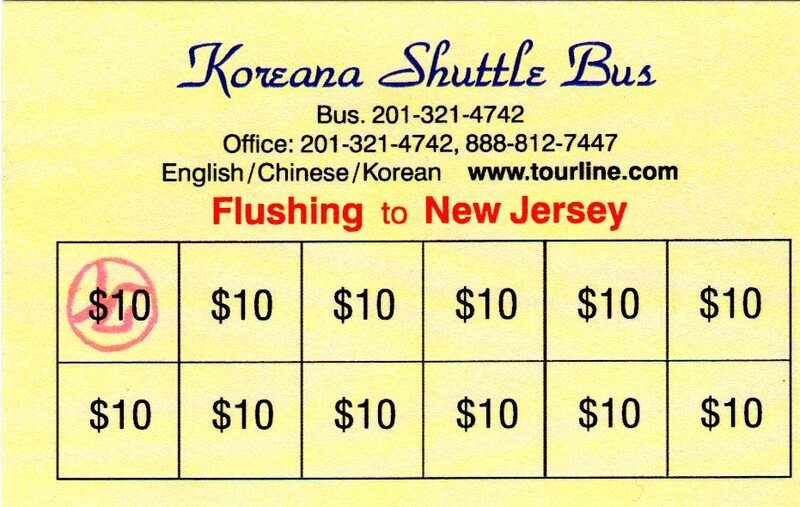 Does anyone know if this korean bus service still exists?